Few things are worse for vehicle others than being stranded. You have places to go, but you're not going anywhere if you have car problems. Depend on our team for 24-hour roadside service. We can get you back behind the wheel again. Most importantly, if we cannot adequately address the problem, we'll tow your car to your mechanic. Emergency roadside assistance is easy and hassle-free whenever you trust us. Don't flag down another driver to help if you're stuck on the side of the road. We have a better and more reliable way to address the problem. Whether you've locked your keys in the car or you have a flat tire, we can help. We deliver fast, professional, and dependable services at affordable prices. Put our number in your phone, (779) 218-0035, and give us a call if you are ever stranded. Can't find your keys? It's no problem when you contact our skilled technicians. We use an auto lockout tool set and an air or plastic wedge to gain access to your car. Because we use state-of-the-art tools, we open cars without damaging them. For 24-hour, emergency services, rely on our company. You have a friend on the road, Magic Towing Service. Regardless of when, why, or where, we respond quickly to your needs and provide courteous roadside assistance. Travel with peace mind, knowing that we are always here to help if you have car problems. We've got you covered, because we care about our customers, their cars, and our excellent reputation in the community. Don't get your hands dirty. 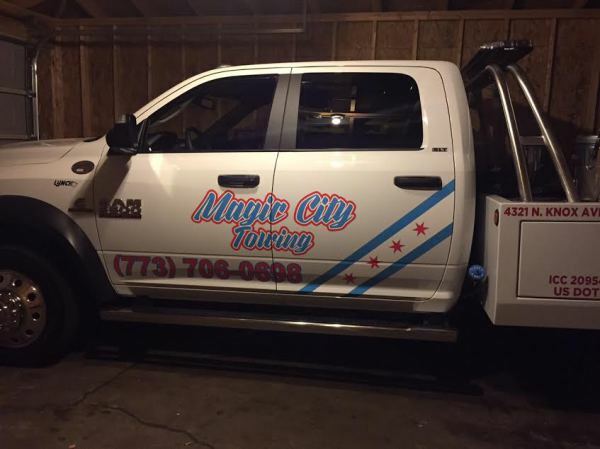 If you have a flat tire, depend on Magic Towing Service for tire change services in Chicago and the surrounding areas. We'll come to your location, fix the problem, install your spare, or replace it with a new tire. At the same time, since you cannot predict when you'll have a flat tire, we are available 24/7 to assist you at any time. Why let a flat tire ruin your day? Contact us for immediate tire changing services. We're changing your tire, not replacing your engine! Don't pay expensive rates for tire changing services. Simply rely on our technicians for fast, easy, and affordable services. From tire changes and repairs to complete replacement, we do it all, but never charge a fortune for our work. It's important to act quickly and carefully when you blow a tire. At the first sign of trouble, grab the wheel firmly and slowly pull it to a safe location at the side of the road. We do not advise driving the car with a flat tire. It could cause damage to the wheel and hub assembly. Simply call us, and we'll be at your location as soon as possible. There's a proper way to repair a tire and a wrong way. If you do it the wrong way, you could have a blow out or other problems down the road. Trust our flat tire repair experts to plug and/or patch your tire the right way. If it's beyond repair, we can also replace it with another one for you. There are several ways to repair a tire: patch repair, tire plug, or tire plug and patch. How can you bring your car to a shop if you have a flat tire? Allow us to provide emergency, mobile flat tire service to ease your mind. Our experienced technicians come to your location with the proper tools to handle the job on site. We provide fast and reliable service as well as the best solution to get you back on the road. Battery failure is one the most common reasons why someone becomes stranded. Whether you left your lights on or the door is ajar, it can drain your battery and dampen your day. Magic Towing Service is there when you need us if you have a dead battery. Our team provides prompt jump start service in the Chicago and the surrounding areas. We give you the "juice" you need to get to an auto repair shop to install a new one. Using a powerful portable battery booster and jump starter, we effectively breathe new life back into your old battery. Our portable boosters automatically sense the polarity of your battery prior to sending power to the vehicle. This eliminates any the damage that can result from reversing the connection. Do You Need a Car Battery Jump Start? Not all towing companies provide a car battery jump start. So, who do you call you're your battery is dead? 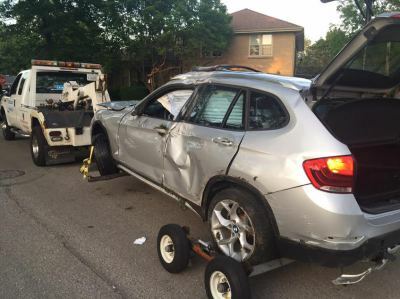 The team at our towing service provides a variety of roadside assistance. From towing and tire changes to lockouts and battery charging, we cater to our customers' immediate vehicle needs. We jump start cars, trucks, and hybrid automobiles. Let us go the extra mile to help when you need battery jump service. In addition to charging batteries, we also replace them. Whether you have a motorcycle, car, or semi-truck, we can install the right battery for your vehicle's make and model. Best of all, we do it on site—no need to bring it to a shop. Contact us for fast services and a free estimate if you need to replace your battery. You've called the towing service, but you've been waiting for nearly an hour. That never happens when you rely on us. We treat every call with urgency and always respond quickly to our customers' needs. For safe, fast, and affordable battery jump service, you can depend on our courteous and experienced team. We are available day and night, as well as on weekends and holidays.